Her "long, blond-streaked hair fall[s] just so above each breast and her cheerleader-pretty face...Any old swatch of cloth rides like a midsummer night's dream on... her ‘most incredibly perfect body.'" 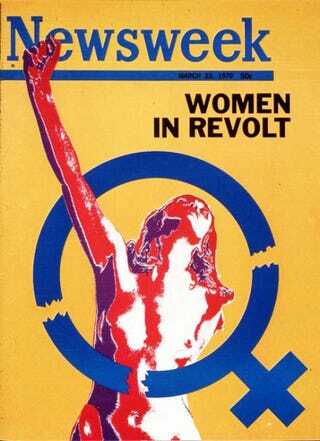 Newsweek sure did appreciate Gloria Steinem's ideas in 1971! The more we talked to our friends and colleagues, the more we heard the same stories of disillusionment, regardless of profession. No one would dare say today that "women don't write here," as the NEWSWEEK women were told 40 years ago. But men wrote all but six of NEWSWEEK's 49 cover stories last year-and two of those used the headline "The Thinking Man." In 1970, 25 percent of NEWSWEEK's editorial masthead was female; today that number is 39 percent. Better? Yes. But it's hardly equality. We should add that we are proud to work at NEWSWEEK. (Really, boss, we are!) We write about our magazine not because we feel it's worse here, but because NEWSWEEK was once ground zero for a movement that was supposed to break at least one glass ceiling. Just as our predecessors' 1970 [gender-discrimination] case didn't happen in a vacuum, NEWSWEEK today is neither unique nor unusual. Female bylines at major magazines are still outnumbered by seven to one; women are just 3 percent of Fortune 500 CEOs and less than a quarter of law partners and politicians. It's nice to see a full-throated embrace of feminism by the magazine that, among its many cycles in and out of the gender war, was responsible for one of Susan Faludi's signature examples of the 1980s backlash against feminism. (The above cover was included in the magazine's own Web gallery). Newsweek has always been a voice and a champion of the establishment (professed flirtations with counterintuitiveness notwithstanding), so if feminism gets to shed some of its marginalization in the process, great. There is a space for media criticism in all this, and for self-criticism, and for self-revelation. And yet to have your entire, extensive editorial package focus on your magazine and its past covers, and your childhood, and your issues with the F-word — well, it's all too easy for something like this to happen. If the actual staff of Newsweek doesn't include much in the way of diversity, isn't it time to utilize those reporting skills of which the traditional media is supposed to be the last guardians? Actually, to be precise, some calls were made. As the ladies at Girldrive point out, "In the 3500 words total that Newsweek devoted to the future of feminism this week, amid the 10 people who are quoted in these pieces, not one woman of color shows up." If this sounds familiar, it should be — since shortly after the days of consciousness-raising and Seven Sisters-educated activists, contemporary feminism has been met with such critiques. In the four decades since Steinem's blonde locks so captivated her Newsweek profiler and taken to stand for all feminism (when it wasn't being outright vilified, of course), the perspectives and critiques of women of color haven't just been heard alongside feminism — they have reshaped it. To assume or imply anything else is, well, retro at the very least. Luckily, the authors have launched an entire blog, The Equality Myth, where they will have ample opportunity to present a fuller picture of what women beyond their ken are dealing with. One again, the Internet saves us all.